50 College Drive Bed and Breakfast is a top quality owner-run guest house which offers Bed and Breakfast or self-catering accommodation in the upmarket and centrally situated suburb of Mill Park, Port Elizabeth. Conveniently located, all that Port Elizabeth has to offer is not far away, including Grey High School, St Georges and Greenacres Hospitals, P.E. Golf Club, P.E. Airport, Greenacres and Walmer Park shopping Malls, Boardwalk Casino and Port Elizabeth’s sunny beaches. We have secure free parking within the grounds behind remote controlled gates. Breakfast is served in the open-plan yellowwood kitchen/dining room which opens onto a wooden pool deck and barbeque area. We have spacious en-suite bedrooms, all tastefully furnished with super comfy Queen, King and Twin beds, made up with Percale linen. Each bedroom is equipped with a fridge, microwave, tea and coffee making facilities, hair-dryers, flat screen T.V with DSTV channels. Our bathrooms are beautiful and have walk-in frameless showers, while two of them also have Victorian baths. Garden Flat/Family Unit – an ideal choice for a family, sleeps 4 in 2 bedrooms which are separated by the fully equipped open-plan kitchen. A spacious shower and toilet lead off the main bedroom. The flat is either fully self catering or B&B. 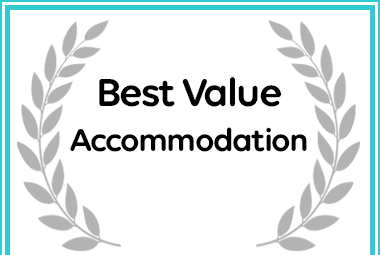 50 College Drive B&B has received an Afristay award for Best Value Accommodation in Mill Park.